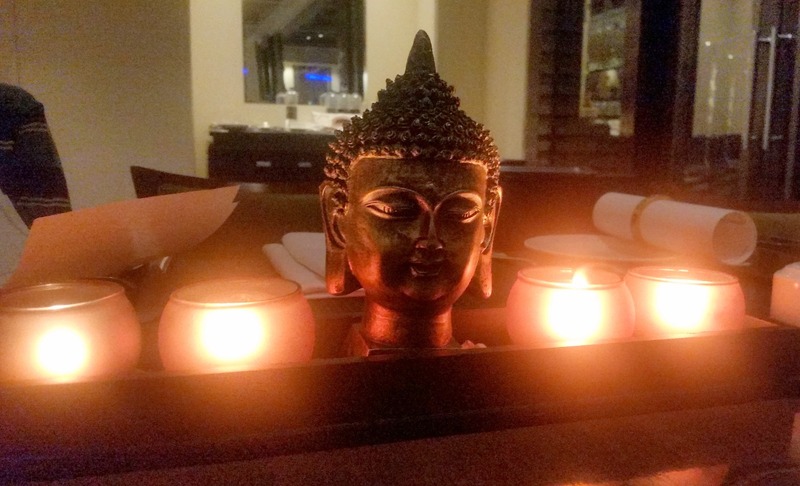 Chef Ninja had since moved to Vintage Asia, the restaurant at JW Marriott Kolkata. 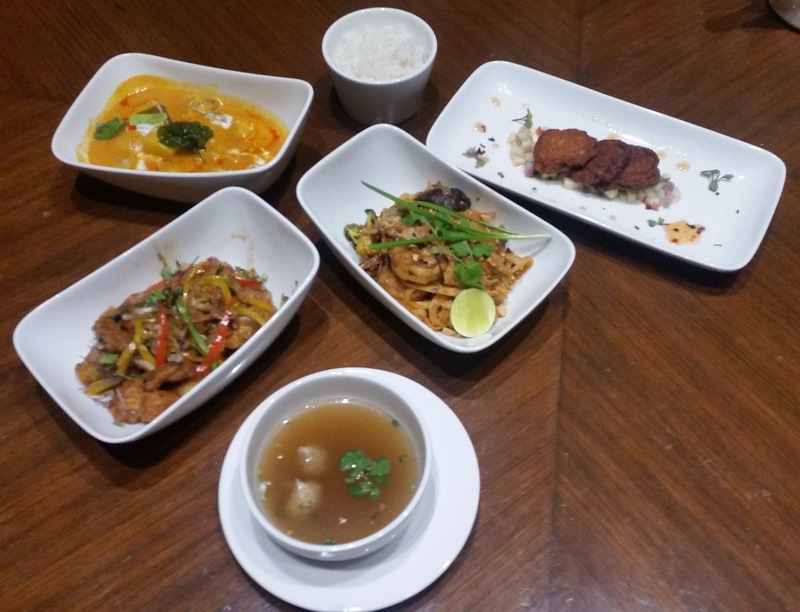 However, Marriott Hyderabad has got her back to Hyderabad for a fortnight curating “Where Thai Cuisine Blooms”, the festival of Thai food at Okra from 20th to 30th April. On offer at the festival are select dishes chosen by Chef Ninja from her vast repertoire. Okra is the all-day dining restaurant at The Marriott, and the promotion will be part of the buffet only for dinner. At a Bloggers’ Table organized by the hotel, we were first served some Thai inspired cocktails. 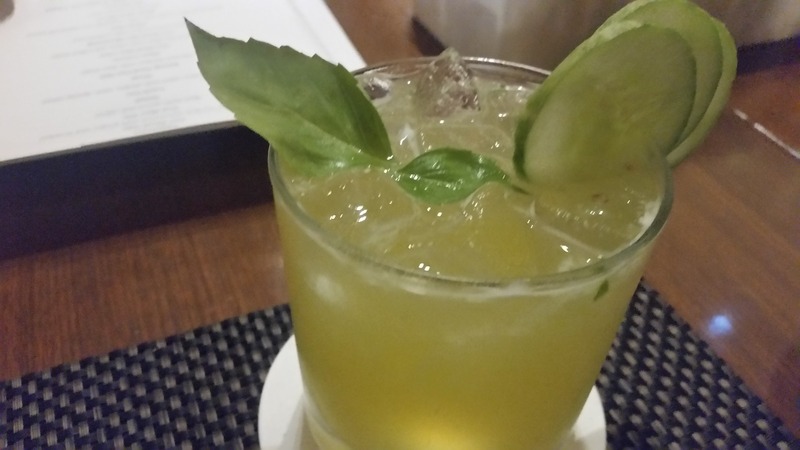 I especially loved a vodka drink which was infused with galangal, as well as the Lemongrass Martini. A set menu was prepared for the sit-down dinner. We started with Tod Man Pla, spiced fish cakes served on a bed of diced onion and cucumber and a sweet chilli sauce. A decent dish where the fish retained its flavours. 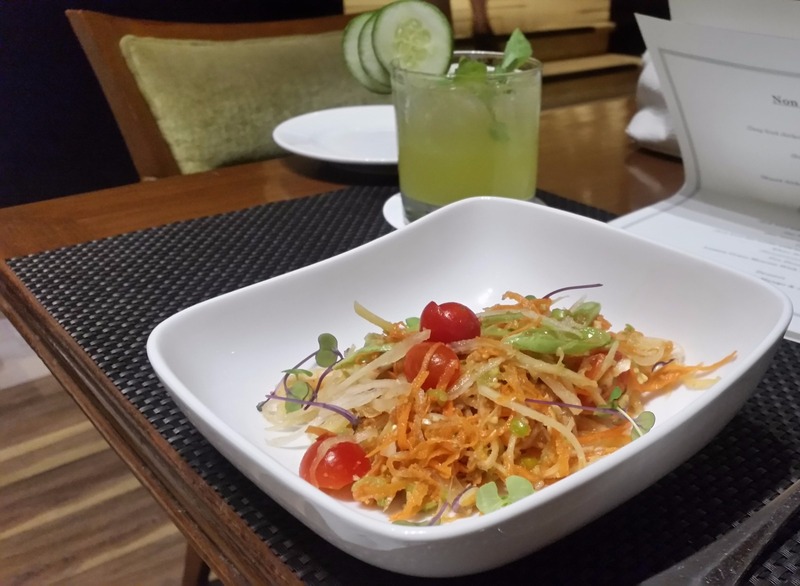 I had always been a fan of Chef Ninja’s Som Tam or raw papaya salad. Today it was more on the spicier side, though the taste was good as usual. 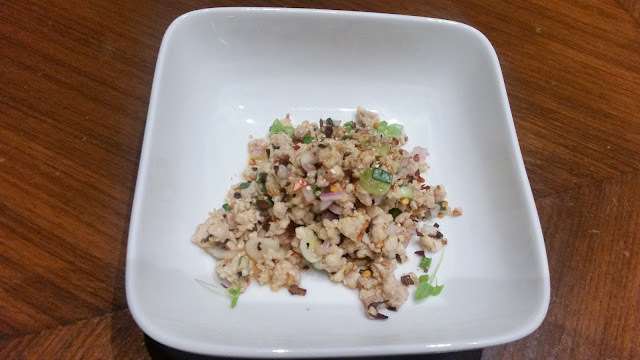 The other salad was Laab Gai, a minced chicken salad with mint and spring onion and garnished with some crunchily fried raw rice, which was a surprise element. The soup list had the signature Thai soup Tom Yum, in its vegetarian avatar (Tom Yum Phak). While the soup had its usual distinct flavours, it was a tad too sour disrupting the balance a bit. 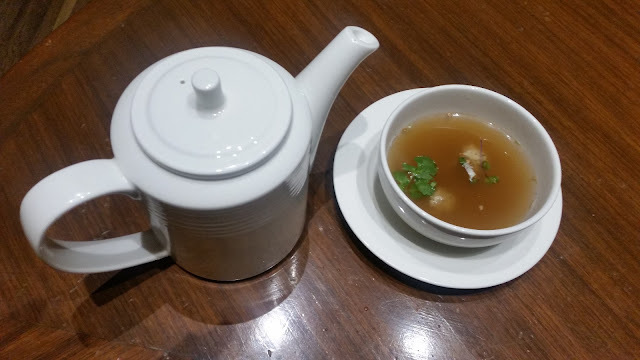 Kaeng Jued Gai Sab, a clear chicken soup with minced chicken balls in it was earthy, and my favourite in this section. The main courses had a range of vegetarian as well as non-vegetarian dishes. Phad Thai is one of the sought after dishes of the Chef, and here the flat noodles were prepared with vegetables in a tamarind based sauce. The traditional Thai yellow curry (Kaeng Curry) was one of the best dishes of the day, with baby potatoes and pumpkin pieces in a fragrant coconut milk based sauce. The Steamed Jasmine Rice worked really well with it. The other main dishes were Pla Phad Ken Chai (Wok fried Fish Fillet with celery) and Gai Phad Met Mamuang (Stir fried chicken with cashew nuts). One of my fellow diners got a mushroom dish from the buffet which tasted rather nice. 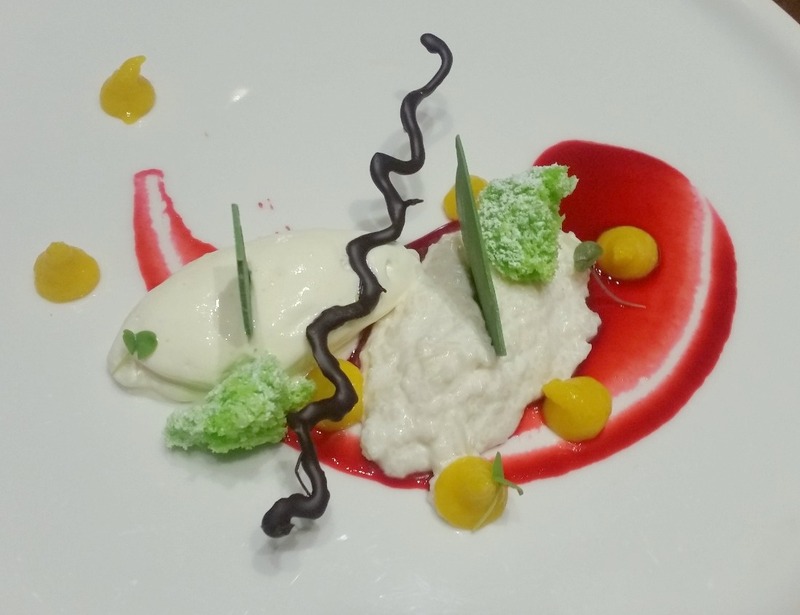 Desserts are something you really look forward to at The Marriott with Chef Ratheesh around. The desserts prepared by him are both stylish and delicious. Here he had infused Thai flavours to both preparations of the day. Tender Coconut Mousse with Mango & Jasmine Rice Pudding was a case in point. The rice pudding here was flavoured with jasmine tea, and the mousse was subtle in taste and brilliantly plated. Lemon Grass Mousse with Pandan Ice Cream was again a nice looking dish, with taste matching up to its looks. Even a person like me who is not a huge dessert lover looks forward to new experiments from Chef Ratheesh. In summary, some nice Thai-inspired drinks and desserts, as well as signature Thai food on the buffet, awaits you when you visit the festival. The festival is on at weeknights (Rs 1350 plus taxes) and is also part of their Sunday Brunch. Chef Ninja has quite a fan following, and I expect the festival to do really well.